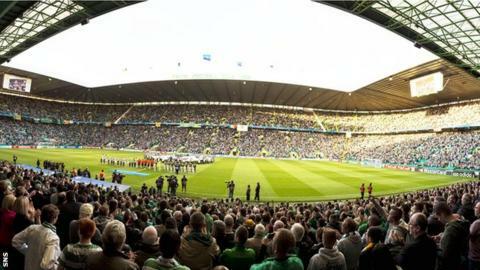 Celtic have announced an increase in profits before tax despite a fall in revenue in the year to 30 June. Profits rose more than £1.4m to £11.17m as the Glasgow club retained the Scottish Premiership title. Celtic say the 14.6% decrease in revenue to £64.74m was partly due to a discount on season tickets. Club chairman Ian Bankier praised former team manager Neil Lennon for contributing to a "pleasing set of annual results". Bankier said the positive finances were a result of "a second consecutive season winning our home league and participating in Uefa Champions League football, together with an increased contribution from the disposal of player registrations during the year". "The momentum accumulated from two such seasons has placed us in a strong financial position going forward," he said in his annual report. The chairman expressed his disappointment that Ronny Deila, who took charge after Lennon resigned at the end of the season, had been unable to steer the club to the group stages of the Champions League this season. But he stated: "The board is fully supportive of the philosophy and long-term approach of the coaching team." Investment in football personnel dropped by £1.6m to £8.07m, with Bankier stressing that the club would continue to "live within our means". "The harsh reality is that the total income from broadcasting rights available to the Scottish game is a tiny fraction of what is available to our neighbours in England," he said. "Within this context and in the face of these hard facts, the board has evolved the strategy that the club, financially, has to adopt a self-sustaining model. "We do our utmost to acquire the best players we can within our financial constraints and the manager and the football operation use their best efforts to develop these players along with the talented players produced by our youth academy." Celtic chief executive Peter Lawwell described it as a successful year for ticket sales, stadium operations, catering and hospitality, merchandising, multimedia and commercial activities. "Our year-end cash at bank position has increased slightly to £3.83m (2013: £3.76m)," he said. "However it should be noted that, during the year, fluctuating cash requirements mean that we are in a net debt position, which peaked at £6.5m during 2013/14." Lawwell, who last month defended the club's transfer policy, described the financial year as "the beginning of a transition for Celtic". "The board will support Ronny and his coaching team in the transfer market and in the development of the football operation generally," he said. "The board will re-invest every penny received back into the club for the longer term. "Although Fraser Forster, Georgios Samaras and Tony Watt left the squad that completed last season, we feel that our squad has grown in strength and depth." Lawwell hoped the club could capitalise on the boost to their "brand" resulting from hosting the League Cup final and Scottish Cup final while Hampden Park was being converted for Commonwealth Games athletics - and Celtic Park's use for the Glasgow 2014 opening ceremony.